Had a rummage around my, these days waaaay to big, bitzbox. I've reached the point where I actually have so many bits it's become counter-creative. Partly because it's hard to find the piece you're looking for but mainly because knowing you could potentially build anything somehow makes building just something less fun. Anyway. 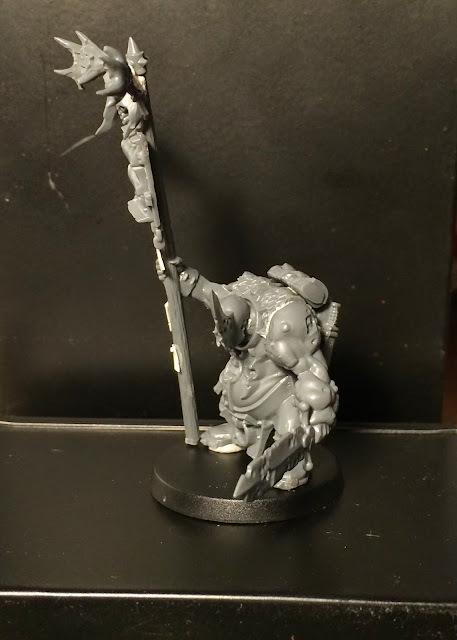 I did manage to tack together this nurgly standard bearer out of an old half-finished conversion and some new blightking bits. He needs some greenstuff work - filling and belly-boils and suchlike but apart from that he looks pretty complete. Glad to see you back in the swing of things. You spark Nurgle creativity. This model is great and the Ork legs and torso are perfect. 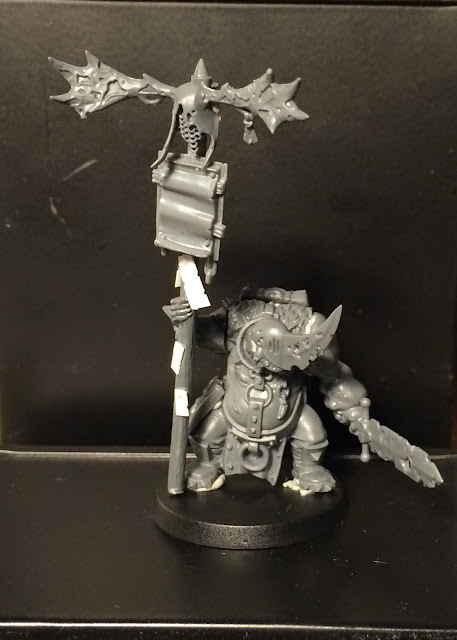 Any chance we will get a write up and/or shot of the entire group of blight king conversions? Thanks mate! Nurgle is simply so much fun! I really gotta get a shot of my whole nurgle-gang but half of the crew is over in England. He looks great! That Rhino Helmet really fits well with the Orc Slaver torso. :) A wonderful conversion that I can't wait to see painted in your trademark style. Cheers mate. The rhino helmet is one of the best bits in the kit. Cool conversion. 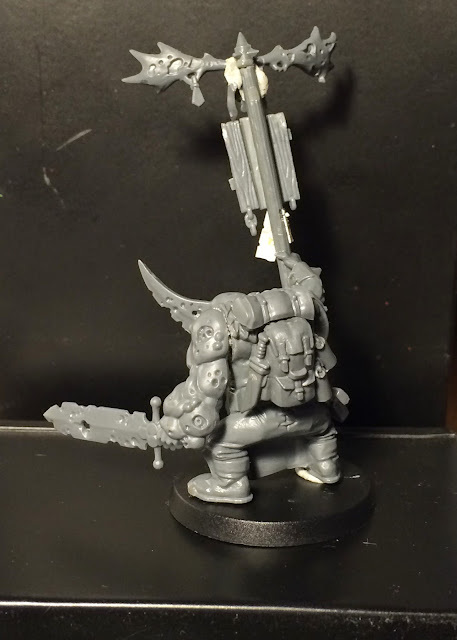 Slow and nurgle-like and yet with some clear movement and direction in the pose. Very nice. Haha! Are people really getting that tired of my patented cyan-blue? Seeing it's one of my nurgly bands colours that might prove difficult... But I solemnly swear to paint some other non-blue mini in the near future! He looks cool. Much as I hesitate to disagree with JRN, I really like your use of the cyan-blue on your nurgly models. It really makes them pop and is a great contrast with the greeny browns usually seen on the Grandfathers children. Thanks for your chromatic support, Stu! Potentially anything, you say? Why not ask for challenges on the blog and the Ammobunker? People might suggest things that are out of the usual comfort zone and give you the challenge you're looking for. Well. Of course I can't build aaaanything - it was just a way of describing an overabundance of bits. Still, that's not a bad idea... Sometimes I should perhaps try a "idea first - model after" approach. I'm in a similar place with bits, so I know how you feel! Are you using thin plasticard for the seals? I am struggling to keep my aluminum foil pristine, but over the years they usually get a bit dented and worn from transporting and the like. Yep. Thin plasticard (or sometimes greenstuff) is my usual way of doing paper/ purity seals etc. It's quick and effective though of course less bendy.